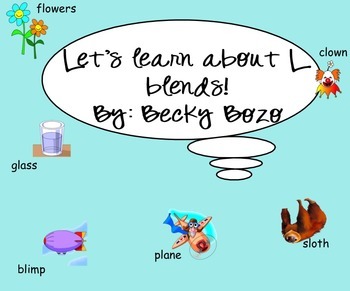 In this smart board lesson students are first introduced to what blends are. The lesson then goes through all of the different blends that contain the letter L. While going through these blends there are pictures to represent different words that begin with that blend. Students will then practice determining which blend words begin with. To do this, there is a picture shown on the page with blends that can be drug next to the picture to complete the word that matches the picture. The lesson then goes a step further where students will determine the blend that goes with a word and will also determine the rest of the word. Later in the lesson there is a blend picture sort where students will be determining which blend each picture begins with and placing it in the appropriate box. In this lesson there are also 2 short video clips included that pertains to blends. At the end of the lesson there are two quick checks included. In one students will write one word that begins with each of the blends that was covered. There is also a box where students can draw a picture of that blend that they thought of. The second included sheet gives pictures and part of the word that matches the pictures. Students will write the blend on the line. These sheets are included in the attachment tab of the lesson and can be opened and printed in pdf format.